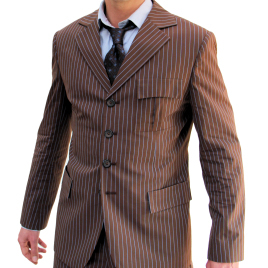 When I ordered this suit from Magnoli several years ago, I requested it be made in wool, because I knew that I would be wearing it normally, and not just for costuming. As always , the fit was perfect and thanks to the large range of 10th Doctor ties that Magnoli reproduces, there is quite a variation in ways that it can be worn. I was so pleased with the cut of this suit that I later ordered another one, in blue, and again went for wool. Now several years later, after it has been worn to many conventions, many days at work, many evenings on the town and during lots and lots of running, it still looks as great as it did when it first arrived. Thank you Indy, this one is certainly the 10 out of 10 suit for me.